Once you get past the pounding of nails, screech of saws and dust in the air, the beauty of the renovations at Palmer Field stops you in your tracks. A wrought-iron entry arch topped with “Palmer Field” spelled out in block lettering, brick columns, stone work, landscape, platform seating near the left-field corner and a new red infield are just some of the high points of the upgrades at 1 Bernie O’Rourke Drive. The work continues at a steady pace, and come Wednesday, one of the crown jewels among the state’s diamonds will be open for a baseball game between Xavier and Amity. The work at the facility, expected to wrap up early this summer, is another reminder of the impact of the “yes” vote in 2015, when Middletown voters approved the passage of a $33.5 million bond calling for renovations of city parks over a period of eight to 10 years. Palmer Field will continue to be home base for the American Legion Post 75 team and Xavier. It’s expected to remain a magnet for CIAC postseason games and a potential host for bigger productions like Legion and college tournaments. As Public Works director Billy Russo pointed out on a recent tour of the park, the upgrades go back to the same thought: provide a top-flight facility for Middletown-based programs and get kids and their parents excited about baseball. The parks bond also helped reimagine the Pat Kidney site at Woodrow Wilson Middle School and provide for new playscapes at Butternut Park, a second set of lights at the Little League fields at Hubbard Park, plus the synthetic skating rink at Harbor Park. Each has been noted, and city officials believe it’s now Palmer Field’s turn. Gene Nocera, who chairs the city’s 21st Century Parks Commission, said about $2 million has been devoted to the work at Palmer Field. At Palmer Field, the result is the look and feel of a modern minor league park affiliated with a Major League Baseball team. The combination of stone and brick created by Torrison Stone & Garden of Durham, and beyond it the black fencing, red dirt and emerald green grass, gives off the quintessential ballpark look. Torrison is one of a handful of local contractors hired to work on the project. Tina Gomes, the city’s chief management analyst who oversees financing for big projects in town, said the renovation team had Baltimore’s Camden Yards in mind when going for Palmer’s makeover. Once beyond the entryway and new ticket booth, the aesthetics come to life. There is a diamond-shaped stone design with landscaping and lighting, and eventually the area will include a bust of Bill Pomfret, the longtime Post 75 commander and coach. 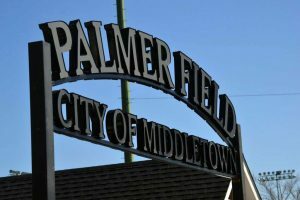 According to Russo, signage acknowledging Middletown High School, Xavier High School, Vinal Tech, Post 75 and the Ahern Whalen Baseball League will adorn the area. With input from Post 75’s leadership, all of Palmer Field is compliant with the Americans with Disabilities Act. Nowhere is this more apparent than the raised, deck-like platform along the left-field line that replaces the previous picnic area. The expansive area includes a ramp and railing and will have park benches and picnic tables for seating. Netting will protect the area against foul balls. Other improvements include the addition of square footage to the concession stand; new sinks and toilets in the restrooms, new foul poles, new mounds in the bullpens, new fencing, and a berm behind the grandstand on the third-base side for new plantings. Stone work and plantings also are being done at Palmer’s entrance for football games beyond the right-field corner of the baseball layout. That area will include a design and bust of O’Rourke, the former Press sports editor, Little League organizer and director of parks and recreation. The busts are being created by Middletown’s Commission on the Arts. Following the high school regular season, Palmer will host CIAC semifinal games on June 5, one night championship game June 8, and three on June 9. The concession is expected to be operational for CIAC play. “The CIAC likes it here, and their games are a fundraiser of sort for the Legion season to keep costs down,” Russo said, adding city officials would like the park to offer college teams the opportunity to play here. “We are seeing some interest from high-level programs to play here,” Russo said. “And we’re not going to lock out kids or teams in the area, but having others in here would help supplement” other programs like Post 75 that use the facility. Eventually, the wooden-plank seating in the grandstand sections will be replaced in favor of new seat-back accommodations. Perhaps this will be the last trace of the Palmer Field of old giving way to the new and vastly improved version. “This will be something that all of Middletown can be proud of,” Nocera said.